A sensational new crime writing talent. A psychological thriller you’ll never forget. Genuinely disturbing and emotionally unsettling... irresistible. 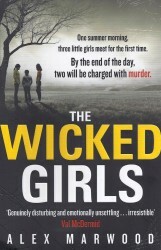 The Wicked Girls is utterly compelling. It's psychologically rich, complex and masterfully plotted. I couldn't put it down, even when I sensed it was taking me somewhere very dark indeed. I can't wait to see what Alex Marwood comes up with next. Alex Marwood's is a shocking and thought-provoking psychological thriller, an impressive debut.